Just a random Sketchcover of The Matador I recently did. There are literally only 2 copies of this left for purchase. This one, which you can get on my store at http://www.sedani.storenvy.com and a blank one which you can also get on there. Wow, 150 editions of Sunday in Rander! Thanks to all who stopped by all those Sundays ago when we started. This special landmark edition will see the release of the complete edition graphic novel. It is officially for sale on my online store right now, as well as amazon.com. Thank you to everyone who helped support me along the way, as well as all the kickstarter backers who helped fund the production of the book. It’s been a fun 5 years! A week or so ago I received the Greymatter Art Return to Rander prints! They came out pretty badass and feel amazing! I wanted to commend Gretymatter Art for their top notch quality! Here is a few pics of the prints. They come numbered and signed by me! I will have some leftover from the kickstarter, so they will be for sale on my store starting in July. A late Memorial Day post for Sunday in Rander here that gives a close look at the first in the Enamel Pin Series! This pin is 2″ tall, and nice and thick. It has some serious weight to it! All physical backers of the Kickstarter get one! It will be on sale on my store and at cons soon! Hey all, wanted to share the wanted poster I made of the Lone Savior. I decided to make it a freebie for all the backers of the latest Kickstarter. So watch for this in your package! SUCCESS!! The Kickstarter campaign for the Complete Edition of Return to Rander was successful! Thanks to everyone who helped make it happen, I am hard at work on finishing the book up and sending it to print next month. I put in the order for the enamel pins and prints and will post more info as it becomes avaialable! Shortly following shipping of the Kickstarter rewards, the book should be available in many avenues. Keep your eye on the blog for further info. BIG NEWS! Usually I will save big news for landmark number editions, but I couldn’t wait for 150 for this news. 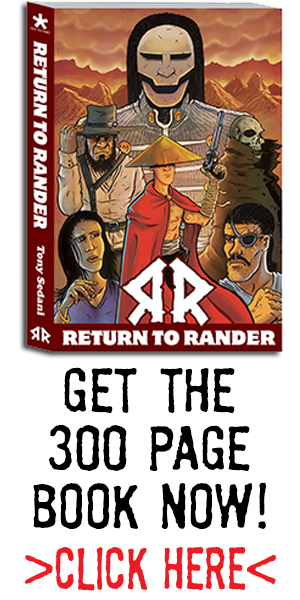 This coming Friday, March 30th, 2018 I will be launching the final Kickstarter campaign for Return to Rander. Exactly 5 years ago I got Issue #1 funded of Return to Rander, and now, I hope we can get the Complete Edition funded. Here is a trailer for the upcoming book! Enjoy. Return to Rander Complete Collection COMING SOON! from Tony Sedani on Vimeo.